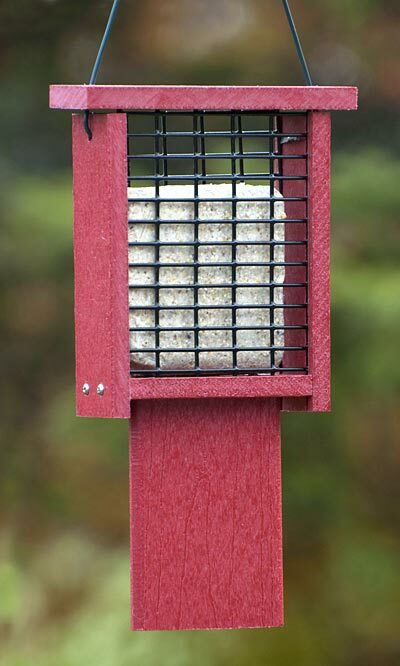 Add bright color in an environmentally-friendly way to your backyard using the Woodlink Red Going Green Suet Feeder with Tail Prop. This hardy feeder easily captures attention, thanks to its bold red color, and its shape is perfect for allowing clinging birds to dine. The recycled plastic body forms a robust unit, and a coated metal grid in the center holds one standard suet or seed cake. Its unique design allows clinging birds to grip the cage, while their tails rest against the extended prop for stability. The flat, red roof protects the suet from rain, and lifts up the attached cable for cleaning or refilling. This durable hanger also makes placement simple, and the convenient size of the feeder allows you to add a few to your garden. Offer select birds a charming dining spot with this Red Going Green Suet Feeder with Tail Prop. Made in the USA.